Cruise Queen Charlotte Sound to Motuara Island and Ship Cove on a 4.5-hour boat tour from Picton. Search for birdlife and marine mammals, such as Hector’s dolphins and bottlenose dolphins, as your captain details the region’s natural and cultural history. Spend time exploring Motuara Island Bird Sanctuary, home to endangered native birds including the South Island saddleback, king shag, little blue penguin and kiwi. Enjoy complimentary tea and coffee on board, with free time ashore in Ship Cove. 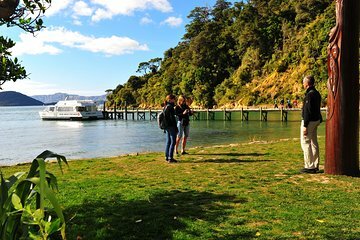 Board your boat at the Picton waterfront and settle in for the 1-hour cruise through Queen Charlotte Sound to Motuara Island, with an additional stop in Ship Cove. Throughout the 4.5-hour excursion, your captain shares area highlights including the wildlife and human history of the Marlborough Sounds. Sip complimentary tea and coffee as you search the waters for little blue penguins and Hector’s dolphins — considered the rarest marine dolphin in the world. Disembark to explore the Motuara Island Bird Sanctuary on your own via an interpretive trail leading to a lookout point at the island’s summit. The regenerated forest has been cleared of all predators, making way for rare native birds to flourish here. During your 60–90 minutes on Motuara, be on the lookout for the saddleback, New Zealand robin, kiwi, bellbird, tui, grey warbler, New Zealand pigeon, silver eye and fantail. You may also view waterbirds like shearwaters, shags and gannets, and glimpse the Maud Island frog and Marlborough green gecko. At the designated time, re-board the vessel for the 10-minute ride to Ship Cove, where Captain James Cook anchored the Endeavor in 1770. Explore the monuments, displays and sheltered beach for 30 minutes before returning to Picton. Please note: It is recommended that you bring your own food, as there are no shops or cafes to purchase snacks during the tour.